Ullswater Heights in Greystoke sleeps between 2 and 8 people, with the accommodation being lodges and safari ten. 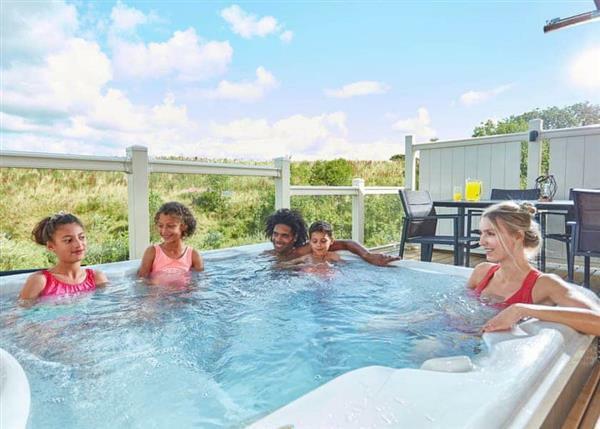 Ullswater Heights has hand-picked lodges and a secluded glamping village featuring deluxe safari tents, all complete with their very own decking and steamy hot tubs set in the landscaped grounds of a former quarry and providing the perfect backdrop for your Cumbrian holiday. Only 6.5 miles from stunning Ullswater and with the chance to see some of the UK’s rarest wildlife including red squirrels, red deer, peregrine falcons and ospreys. Ullswater Heights sits between two of England’s most famous holiday destinations, offering views across both the Yorkshire Dales and the Lake District this is a truly enviable location for the perfect family holiday. Ullswater has been a tourist hot spot for generations with its country pubs and castles. Take in the picturesque lake shoreline on foot, by bike, canoe or more serenely by steamer. With great pubs and restaurants all close by and the pretty village of Greystoke, famed as the bithplace of Tarzan, a short walk away you’ll be sure to find plenty to keep you entertained all year round in this luxury resort. With a quality dining experience available on site you can sit and enjoy a family meal overlooking Ullswater Height’s private quarry lake. There is a welcome pack including tea, coffee, milk, bread, biscuits and a selection of local produce. Ullswater Heights has a bar & restaurant, along with a childrens’ playground. If you want to find out what other people have said about Ullswater Heights, read the reviews on Ullswater Heights for more information. And, for those last minute bargains, have a look at some of the special offers available at Ullswater Heights. "Brand new for 2019. 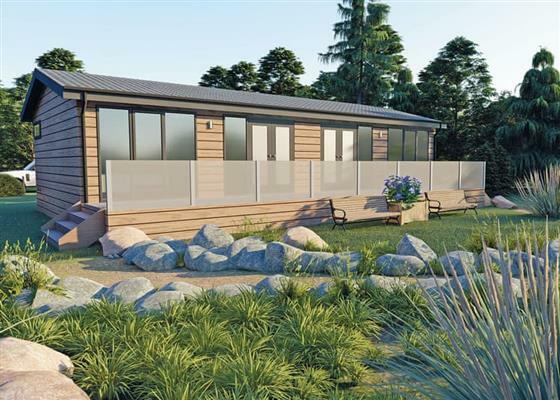 Contemporary semi-detached lodge with master double with ensuite shower. Modern, well equipped open plan living and kitchen area leading to generous deck with quality garden furniture and outdoor hot tub." "Brand new for 2019. 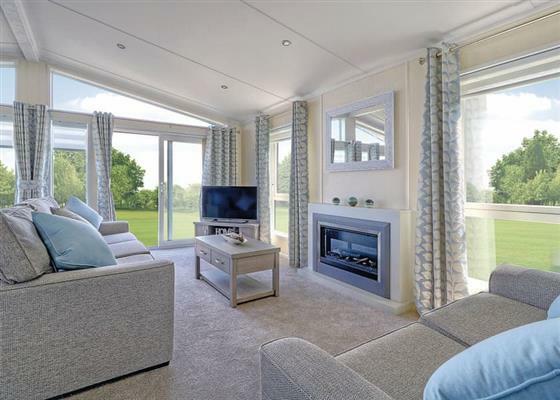 Contemporary semi-detached lodge in an enviable park location with unique views across the 7 acre quarry lake with the majestic Yorkshire Moors providing a stunning backdrop. Master double with ensuite shower room. Modern, well equipped open plan living and kitchen area leading to generous deck with quality garden furniture and outdoor hot tub." "Brand new for 2019. Ultra spacious luxurious lodge with one double with ensuite bath or shower and one twin (double by arrangement). Bathroom with bath with overhead shower. Modern, well equipped open plan living, kitchen and dining area with doors leading to decking with quality garden furniture and outdoor hot tub. Stunning views over the private 7 acre quarry lake and out across the majestic Yorkshire Dales." "Brand new for 2019. Ultra spacious luxurious lodge with one double with ensuite bath or shower and one twin (double by arrangement). Bathroom with bath with overhead shower. 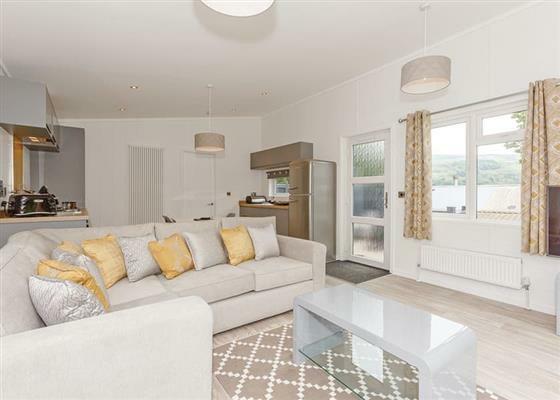 Modern, well equipped open plan living, kitchen and dining area with doors leading to decking with quality garden furniture and outdoor hot tub with views over the magnificent Lake District. From the front of your lodge you’ll look over the private 7 acre quarry lake and out across the majestic Yorkshire Dales." "Brand new for 2019. 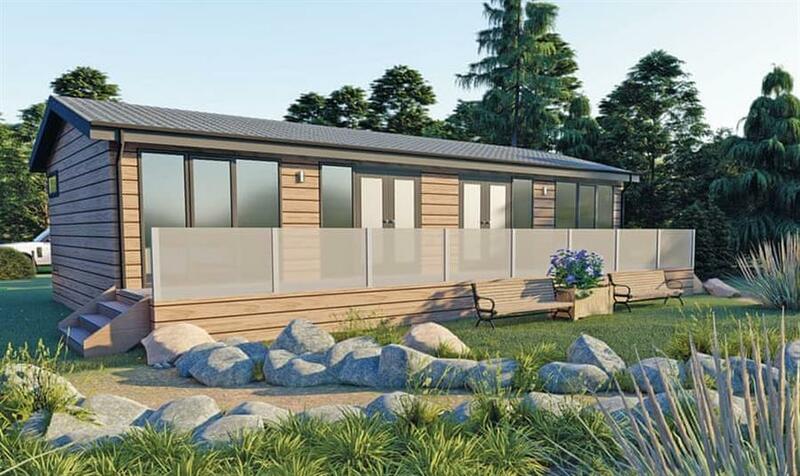 Spacious and contemporary lodge with one double with ensuite shower and one twin (can be double by arrangement). Family shower room. Open plan living, kitchen and dining area. Doors leading to decking with quality garden furniture and outdoor hot tub." Brand new for 2019. Superb lodge in an enviable park location with unique views across the 7 acre quarry lake with the majestic Yorkshire Moors providing a stunning backdrop. Two doubles (can be singles by arrangement) both with ensuite shower rooms. Well equipped and modern open plan living area with kitchen and dining area. 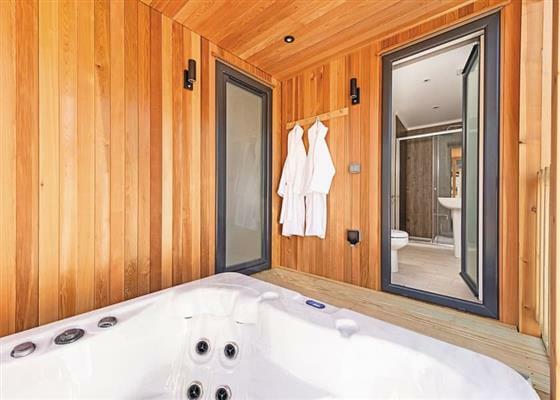 Doors leading to decking area with outdoor hot tub and views to lose yourself in. No pets. "Brand new for 2019. Sumptious lodge with one double with ensuite bath with overhead shower and one twin (double by arrangement). Family bathroom with bath with overhead shower. Modern, well equipped open plan living, kitchen and dining area with doors leading to decking with quality garden furniture and outdoor hot tub with views over the magnificent Lake District. From the front of your lodge you’ll look over the private 7 acre quarry lake and out across the majestic Yorkshire Dales." "Brand new for 2019. Sumptious and luxurious lodge with one double with ensuite bath with overhead shower, one double and one twin (double by arrangement). Bathroom with bath with overhead shower. 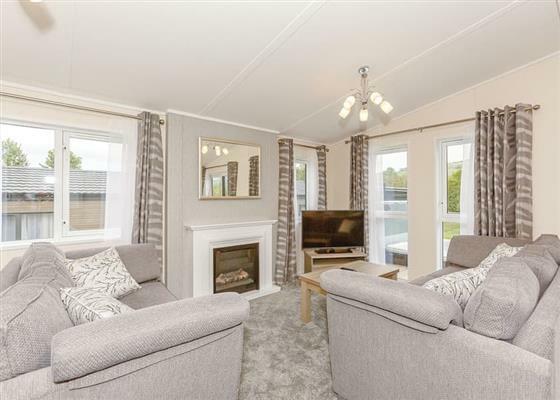 Modern, well equipped open plan living, kitchen and dining area with doors leading to decking with quality garden furniture and outdoor hot tub." "Brand new for 2019. Ultra spacious luxurious lodge with one double with ensuite bath or shower and two twin (can be doubles by arrangement). Bathroom with bath with overhead shower. 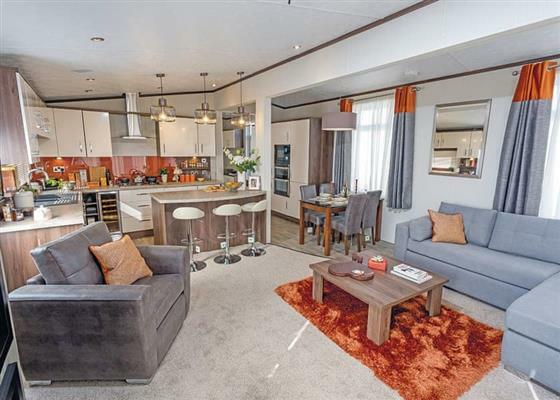 Modern, well equipped open plan living, kitchen and dining area with doors leading to decking with quality garden furniture and outdoor hot tub." "Brand new for 2019. Spacious and contemporary lodge with one double with ensuite shower and two twin (can be doubles by arrangement). Family shower room. Open plan living, kitchen and dining area. Doors leading to decking with quality garden furniture and outdoor hot tub." "Brand new for 2019. Stunning luxurious lodge with one double with ensuite bath with overhead shower and one double and two twin (can be doubles by arrangement). Family shower room. 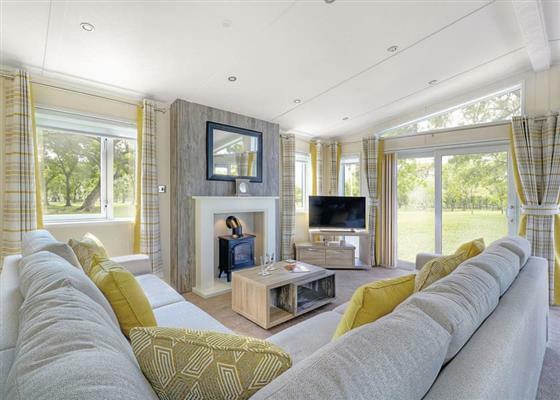 Modern, well equipped open plan living, kitchen and dining area with doors leading to decking area with quality garden furniture and outdoor hot tub." Brand new for 2019. 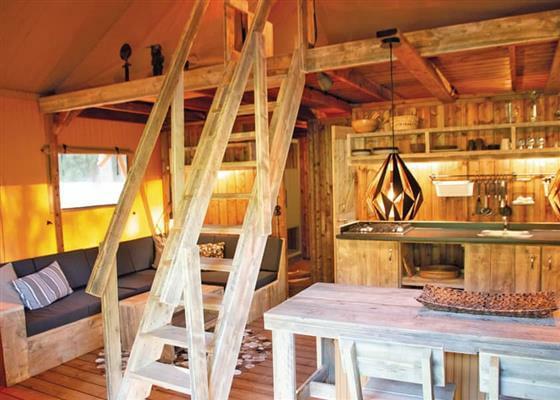 Superior glamping tent providing the very best luxury. Ground floor: Master bedroom with four poster bed and ensuite shower. Second Double bedroom. Family bathroom with shower. 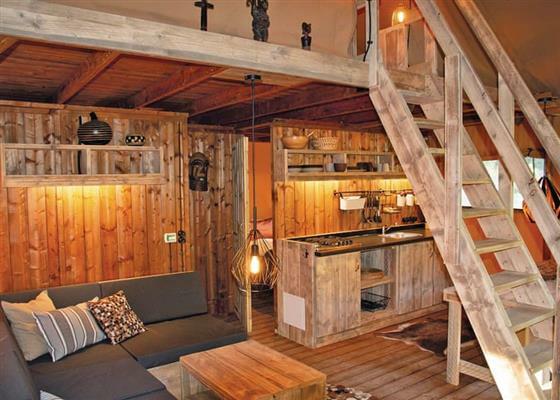 Generous open plan living with wooden floors and woodburner. Outdoor hot tub. First Floor: Four single beds. Brand new for 2019. Superior glamping tent providing the very best luxury. Ground floor: Master bedroom with four poster bed and ensuite shower. Second Double bedroom. Family bathroom with shower. Generous open plan living with wooden floors and woodburner. Outdoor hot tub. First Floor: One twin. Find out about Ullswater Heights, including prices and availability. There aren't currently any special offers at Ullswater Heights however, the special offers shown below are all on parks within 30 miles of Ullswater Heights - so you may find these useful. Holiday at Ruskin 2 in Cumbria starting on Saturday 27 April 2019 for 7 nights. Holiday at Wordsworth Log Burner in Cumbria starting on Saturday 27 April 2019 for 7 nights. Holiday at Turner 3 in Cumbria starting on Saturday 27 April 2019 for 7 nights. Holiday at Ullswater Apartment in Cumbria starting on Saturday 27 April 2019 for 7 nights. Holiday at Fell View Apartment in Cumbria starting on Saturday 27 April 2019 for 7 nights. Holiday at Duplex Apartment in Cumbria starting on Saturday 27 April 2019 for 7 nights. Holiday at Skiddaw in Cumbria starting on Saturday 27 April 2019 for 7 nights. Holiday at Souther Fell in Cumbria starting on Saturday 27 April 2019 for 7 nights. Holiday at Langdale in Cumbria starting on Saturday 27 April 2019 for 7 nights. Holiday at Buttermere in Cumbria starting on Saturday 27 April 2019 for 7 nights. Holiday at Hawkshead Lodge in Cumbria starting on Saturday 27 April 2019 for 7 nights. Holiday at Derwent Lodge in Cumbria starting on Saturday 27 April 2019 for 7 nights. Holiday at Kentmere Lodge in Cumbria starting on Saturday 27 April 2019 for 7 nights. Holiday at Bassenthwaite in Cumbria starting on Saturday 04 May 2019 for 7 nights. Holiday at Helvellyn in Cumbria starting on Saturday 04 May 2019 for 7 nights. Holiday at Elter in Cumbria starting on Saturday 04 May 2019 for 7 nights. Holiday at Motherby 2 in Cumbria starting on Saturday 04 May 2019 for 7 nights. Holiday at Berrier 2 in Cumbria starting on Saturday 04 May 2019 for 7 nights. Holiday at Souther Fell in Cumbria starting on Saturday 04 May 2019 for 7 nights. Holiday at Uvedale in Cumbria starting on Saturday 04 May 2019 for 7 nights. Holiday at Bassenthwaite Apartment in Cumbria starting on Saturday 11 May 2019 for 7 nights. Holiday at Bronze 2 in Cumbria starting on Saturday 11 May 2019 for 7 nights. Holiday at Silver 2 in Cumbria starting on Saturday 11 May 2019 for 7 nights. Holiday at Silver 3 in Cumbria starting on Saturday 11 May 2019 for 7 nights. Holiday at Fairfield Lodge in Cumbria starting on Saturday 18 May 2019 for 7 nights. Holiday at Patterdale Lodge in Cumbria starting on Saturday 18 May 2019 for 7 nights. Holiday at Sedgewick in Cumbria starting on Saturday 18 May 2019 for 7 nights. Holiday at Kentmere Lodge in Cumbria starting on Saturday 01 June 2019 for 7 nights. There are 51 holiday parks within 5 miles of Ullswater Heights. Knott View Barn in Kirkby Lonsdale, Cumbria, and sleeps 11 people. 32 miles. Jebel Kasr in Keswick, Lake District, and sleeps 2 people. 15 miles. Pound Farm Farmhouse in Crook, Cumbria, and sleeps 10 people. 23 miles. Inglecroft in Wigton, Cumbria, and sleeps 15 people. 19 miles. Lenys Cottage in Middleton-in-Teesdale, Durham, and sleeps 7 people. 31 miles. Blea Beck in Askam-in-Furness, Cumbria, and sleeps 4 people. 37 miles. Greenswangs House in Lockerbie, Dumfriesshire, and sleeps 8 people. 33 miles. Springfield House in Middleton-in-Teesdale, Durham. 31 miles. Church View in Ambleside, Cumbria. 18 miles. Harts Close in Kirkcudbright, Kirkcudbrightshire, and sleeps 2 people. 49 miles. Bowser Hill Farm Cottages - High Pasture Cottage in Newcastle-upon-Tyne, Northumberland. 43 miles. Abbys in Millom, Cumbria, and sleeps 4 people. 37 miles. Hollow Creek Cottage in Carlisle, Cumbria, and sleeps 2 people. 17 miles. Spider Cage Cottage in Tow Law, Durham. 41 miles. Marthas Shore Cottage in Dumfries, Dumfriesshire. 37 miles. Ing Hill Barn Apartments in Mallerstang Dale, Kirkby Stephen. 28 miles. Algars Garth in Penrith, Cumbria. 1 miles. Pound Farm Farmhouse in Kendal, Cumbria, and sleeps 10 people. 23 miles. Cumberland Cottage in Orton, Cumbria, and sleeps 2 people. 18 miles. Whitecroft in Cartmel, Cumbria, and sleeps 6 people. 34 miles. Corn Meadow in Kirkby Lonsdale, Cumbria, and sleeps 4 people. 9 miles. The Mount in Sedbergh, North Yorkshire, and sleeps 8 people. 28 miles. Beckside Cottage in Penrith, Cumbria, and sleeps 6 people. 24 miles. The Nunnery in Leyburn, North Yorkshire. 45 miles. Kentdale in Ambleside, Cumbria, and sleeps 6 people. 18 miles. Natterjack Cottage in Millom, Cumbria, and sleeps 5 people. 38 miles. Top Byre in Bishop Auckland, Durham, and sleeps 2 people. 27 miles. Silverholme in Lake Windermere, Cumbria. 26 miles. Holme View in Hawes, North Yorkshire, and sleeps 4 people. 37 miles. Enys in Morecambe, Lancashire, and sleeps 4 people. 42 miles. Quarry Cottage in Corbridge, Northumberland, and sleeps 2 people. 40 miles. Tithe Barn in Dalton, Cumbria, and sleeps 8 people. 40 miles. White Moss - Number 2 The Terrace in Windermere, Cumbria, and sleeps 11 people. 21 miles. Tyan Cottage in Kirkby Lonsdale, Cumbria, and sleeps 4 people. 32 miles. The Wee Byre in Dumfries, Dumfriesshire, and sleeps 6 people. 44 miles. Wastwater in Ambleside, Cumbria. 19 miles. Hawkrigg House in Coniston, Cumbria, and sleeps 8 people. 26 miles. Drumblane Strand in Kirkcudbright, Kirkcudbrightshire, and sleeps 7 people. 49 miles. Old St. Lukes Church in Kirkby Stephen, Cumbria, and sleeps 6 people. 22 miles. Station House in Hornby, Lancashire, and sleeps 6 people. 39 miles. Oakdene in Sedbergh, Cumbria, and sleeps 20 people. 29 miles. The Refuge in Appleby, Cumbria, and sleeps 5 people. 21 miles. Spen House in Settle, Lancashire, and sleeps 10 people. 42 miles. Langthwaite in Grasmere, Cumbria, and sleeps 8 people. 18 miles. Blackthorn Cottage in Middleton-in-Teesdale, Durham, and sleeps 4 people. 33 miles. Candy Cottage in Kirkby Lonsdale, Cumbria, and sleeps 4 people. 35 miles. Netherend in Keswick, Cumbria, and sleeps 10 people. 8 miles. The Old School in Reeth, North Yorkshire, and sleeps 10 people. 39 miles. Tarset Tor in Hexham, Northumberland, and sleeps 20 people. 39 miles. The White House in Dalbeattie, Dumfries and Galloway, and sleeps 8 people. 42 miles. Edmond Castle in Brampton, Cumbria, and sleeps 10 people. 16 miles. Riven Oak in Kendal, Cumbria, and sleeps 8 people. 27 miles. Blue Door in Kirkcudbright, Kirkcudbrightshire, and sleeps 7 people. 49 miles. One Clearwater in Carnforth, Lancashire, and sleeps 6 people. 38 miles. Mill Moss Barn in Ullswater, Cumbria, and sleeps 4 people. 11 miles. Wood Hall Estate in Cockermouth, Cumbria, and sleeps 18 people. 20 miles. Ingleston Cottage in Moffat, Dumfriesshire, and sleeps 4 people. 46 miles. Scarfoot in Patterdale, Cumbria. 11 miles. Beck View in West Burton, North Yorkshire. 45 miles. Borrowdale View in Keswick, Cumbria, and sleeps 12 people. 13 miles. Longdale Cottage in Hawes, North Yorkshire, and sleeps 4 people. 40 miles. Eden Lodge in Ulverston, Cumbria, and sleeps 25 people. 37 miles. Oakbank Farmhouse in Cockermouth, Cumbria, and sleeps 6 people. 20 miles. Old Joiner's Shop in Windermere, Cumbria, and sleeps 12 people. 26 miles. Aspen Cottage in Windermere, Cumbria, and sleeps 9 people. 21 miles. Housekeepers in Middleton-in-Teesdale, Durham. 31 miles. Hazel Grove House in Kirkby Lonsdale, Lancashire, and sleeps 12 people. 35 miles. Spring Bank in Penruddock, Cumbria, and sleeps 11 people. 5 miles. The Old Chapel in Melmerby, Cumbria, and sleeps 6 people. 10 miles. Yew Tree Farm in Penrith, Cumbria, and sleeps 15 people. 13 miles. The Garth in Penrith, Cumbria, and sleeps 7 people. 4 miles. Townend Farm in Appleby-in-Westmorland, Cumbria. 21 miles. Mill Dam House in Castle Douglas, Kirkcudbrightshire, and sleeps 14 people. 46 miles. The Garth in Threlkeld, Cumbria, and sleeps 8 people. 6 miles. Berkeley House in Keswick, Cumbria. 13 miles. Ingle Neuk Cottage in Keswick, Cumbria, and sleeps 4 people. 6 miles. Gill Cottage in Kirkby Stephen, Cumbria, and sleeps 8 people. 22 miles. Mole Cottage in Hexham, Northumberland, and sleeps 10 people. 41 miles. Millburn Cottage in Kirkcudbright, Dumfries and Galloway, and sleeps 4 people. 49 miles. This cottage in Richmond, North Yorkshire, and sleeps 16 people. 48 miles. Holbrook House in Richmond, North Yorkshire, and sleeps 10 people. 47 miles. York House in Richmond, North Yorkshire, and sleeps 10 people. 47 miles. Larchwood in Greystoke, Cumbria. 4 miles. Deer Close West Farmhouse in Horsehouse, North Yorkshire. 49 miles. Lawn House in Low Road, North Yorkshire, and sleeps 8 people. 39 miles. Cobwebs in Grange-over-Sands, Cumbria, and sleeps 6 people. 32 miles. Croft House Barn in Blindcrake, Cumbria, and sleeps 12 people. 19 miles. Crayke House in Leyburn, Yorkshire Dales National Park. 44 miles. The Old Rectory in Uldale, Lake District National Park, and sleeps 8 people. 13 miles. Croft House Cottages in Keswick, Lake District National Park, and sleeps 4 people. 13 miles. Bush Green Cottage in Broughton-in-Furness, Cumbria, and sleeps 6 people. 32 miles. Cleabarrow Cottage in Windermere, Lake District National Park, and sleeps 12 people. 23 miles. Bluebell Barn in Kirkby Stephen, Yorkshire Dales National Park, and sleeps 6 people. 23 miles. Ross Lodge in Kendal, Cumbria, and sleeps 14 people. 28 miles. Marron Cottage in Cockermouth, Cumbria, and sleeps 4 people. 24 miles. The Dale Manor in Allendale, Northumberland, and sleeps 18 people. 29 miles.